You know a product is beyond fantastic when it was created for the sole purpose circling around a mother’s goal to keep her son healthy; help him loose weight and maintain a positive self image. 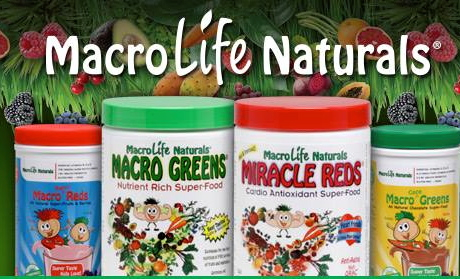 Made from the purest, non-allergenic ingredients to promote health and wellness, MacroLife natural products has become the go to tasty nutrient rich super food. Macro Greens tastes great on its own or mixed into different types of drinks & smoothies. Found at Whole Foods, and other leading grocery retailers across the U.S MacroLife has become readily available to consumers seeking a balanced healthy nutritional supplement. From smoothies to martinis, MacroGreens is a great tasting way to stay healthy and have the energy to enjoy the day. Mix 1 cup (8oz) cold apple juice and 1 ½ cup (12oz) cold purified water, add 1-Tablespoon Macro Greens . Shake or Stir well, serve and enjoy.